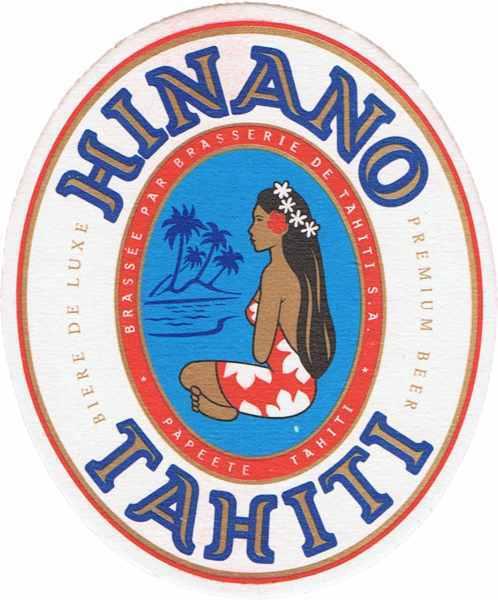 On a black or blue background, we can see a vahine Hinano at the center of the towel, such as on the logo of the famous Hinano local beer brand. She is sitting cross-legged, wearing a red sarong with white Tiare flowers. At the back, there is the sea with an island and coconut trees. Some marquisian drawing are scattered on the towel. The words HINANO TAHITI are written in yellow or white upper-case letters and "South pacific" and "Surfriding" are written in smaller on each side. Around the vahine we can also read the names of the most famous surfing spot of Polynesia : Teahupoo, Papara, Taapuna, Papenoo Beach, and below : Papeete - Tahiti.